For 23 years, I have lived in Troy, Mich., a suburb of Detroit. Troy is a city of 81,000, with the second-most-diverse population in Michigan and an award-winning school district (usnews .com/education/best-high-schools/michigan). It is located within Oakland County, which historically is one of the highest per-capita income counties in the state, and CNN Money has ranked Troy 22nd on its list of “Best Places to Live” in the U.S. Conversely, it has the second-lowest millage rate in the region. In May 2008, Jeanne Stine, Troy’s former mayor and then-president of the Friends of the Troy Public Library (FTPL; friendstpl.org), asked if I would be interested in becoming an FTPL board member. She knew I had my M.L.I.S. and that, as a film producer, I was accustomed to managing projects and people. Becoming a Friends board member seemed benign enough, so I agreed to be the communications director. Within the year, I had moved from that position to president. In September 2009, FTPL members were busy renovating a section of the library lobby to become a gift shop when the city announced that it was going to have a 1.9-mill millage vote for roads, public safety, and the library. The city council voted to close the library permanently in May 2010 if the millage didn’t pass. This was a devastating shock to the library administration and the Friends. In a special election in February 2010, the millage failed. Miserably, I might add, due to a city administration that underestimated a strong anti-tax sentiment among a small but virulent group. The city council then informed the citizens that it would give the library additional time, and it set the new closing date for July 2011. At that time, Troy Public Library (TPL; troypl.org) circulated more than 1.5 million items a year, had approximately 15,000 people enjoying programs annually, and was ranked 10th in the nation in its population category by Hennen’s American Public Library Ratings Index. Ultimately, it took 2 years and three millages to battle the false ballot proposals, the aggressive anti-tax/anti-library crowd, and the threat of a book burning party to finally save our city library. When the city announced the library’s closing, citizens inundated the Friends with requests to do something about it. We had no experience in these matters, because in the 55-year history of our organization, the public library was always a department of the city with all costs paid from the city budget. I spent many weeks researching libraries in Michigan and how they are governed, paid for, and managed. I met with library experts, library directors, library attorneys, and city administrators. After a great deal of consideration, FTPL decided to hold two public forums to get the pulse of the community and to see what action, if any, we could take. In May 2010, we held the forums and learned that many residents were supportive of paying a little extra to keep the library open, even if they were somewhat unhappy with the city’s staff and council. They did not want the library to be a political football, to be yanked away in classic Charlie Brown-style whenever the city was having financial woes. In June 2010, a group of citizens formed to create a ballot question committee. 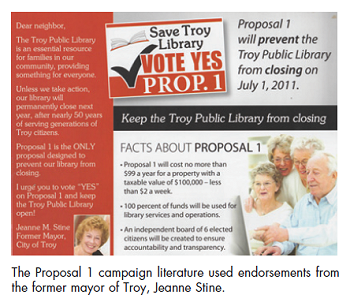 Citizens to Save Troy Public Library (CSTPL) was launched with a steering committee of about 12 enthusiastic residents. I stepped away from FTPL to run the ballot committee, and our vice president took over the Friends. The Friends Were Fired Up! In August 2010, we submitted our proposal. We had a great groundswell of supporters. We put together one of the most robust grassroots field organizations the city had seen to date. With 31 precincts, seven school districts, and more than 52,000 registered voters, it would require a huge effort to get the word out. Our volunteer coordinator managed more than 70 precinct captains and many other volunteers, including walkers, phone callers, literature distributors, and mailers. Between June and November, I gave more than 70 speeches, appearing for any and all organizations that would have me. It was my mission to educate and inform the people about what was happening and what they could do about it. It was stunning to us how often we discovered that people had no idea this was happening in their own community. During this time, the steering committee was getting some indications that the aforementioned anti-tax/anti-library group was getting organized, and it was notorious for employing negative tactics in previous local political campaigns. That group was called Troy Citizens United. It operated with a very committed, stealthy core leadership that included a Republican county commissioner, a sitting city council member, the Tea Party, and others who were sympathetic to anti-tax, small-government causes. We resolved that our campaign would stay positive and educational. Just as we were making headway with the public, the 50-signature petition came back to bite us, hard. Three residents from Troy Citizens United easily got enough signatures to put three false proposals on the ballot. They copied our ballot language exactly, changing only the mills by tiny amounts. We knew these proposals were bogus because whenever the press, city clerk, and city attorney tried to talk to the people who submitted them, they went underground and would not respond to any inquiries. They also were invited to attend a panel discussion put on by the League of Women Voters but never responded to the invitation. These extra proposals were specifically designed to confuse people and to split the vote come Election Day. It was a setback, as it caused CSTPL to spend precious time and resources to explain this political chicanery and to educate residents on our legitimate proposal. Troy Citizens United’s tactics included lie-filled mailers, misinformation, and obfuscation at every turn. It could see that our grassroots library proposal was making progress and turned up the heat to hamper our momentum. The group was out to win by any means necessary. Unfortunately, good people that supported our initiative had the misguided notion that if they voted for all the proposals, then at least one of them would pass, thus saving the library. That was not the case. In November 2010, with the vote split, all four proposals failed. Our Proposal 1 lost by 677 of 30,000 votes cast. It was a sad day for library supporters. But it was also a sad commentary on a very divided community. The ugliness spread from the city council podium to the news media and beyond and set a tone for our city that continued for more than 2 years. Cathy Russ, TPL’s director, began the difficult process of readying the library for closure. As staffers were being laid off and programs were canceled, many residents were still oblivious to what had been happening for the past year and a half. But when Cathy posted the closing date of the library, residents finally began to take notice. So in early 2011, many of the CSTPL volunteers, buoyed by fresh voices in a newly formed committee called Save Troy Library, decided to try again. With the city government driving the millage this time, greater community awareness, a more aggressive campaign posture, and a new influx of money, this campaign started with renewed energy. So, with the field operation already in place and CSTPL having spent a year educating the public on the issue while shining a very big light on the anti-library crowd, the campaign for the new millage began. The city spent a great deal of time and energy this time, holding town hall meetings to inform the residents about the millage vote, which was set for Aug. 2, 2011. As the election approached, there was a decided concern that Troy Citizens United would pull another last-minute dirty trick. What we didn’t know was there was another plot simmering. This was the shot heard ’round the library world. 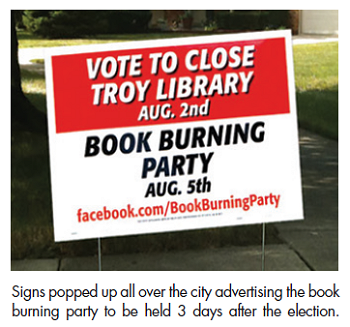 Signs advertising a book burning party at our public library (on a date just days after the election) began popping up around Troy. I first became aware of the book burning party in July 2011 when I saw a sign advertising it at an intersection near my home. I couldn’t believe it. I made my husband pull the car over. I immediately called Cathy Russ; she knew nothing about it. It was a punch in the gut for us because for 2 years, various citizens had asked Cathy and the FTPL, “When are you having a sale to get rid of the books?” or “When is the ‘fire sale?’” So the fact that someone out there was actually gleefully advertising the demise of our library was beyond our comprehension. There was even an ad in the local newspaper for a clown for the book burning party and a video posted of the library stacks through a window at night, suggesting where the fire should be started. It was incredibly sickening and painful since we had spent so much time and energy trying to educate, remove fear, and build community trust. This seemed damaging to all those efforts. In retrospect, it was simultaneously repugnant and brilliant. As an advertising professional, I see the value of this campaign—now. But back then, in the midst of 2 years of 14-hour days battling to save our library, I (along with many others) was outraged. The news media was all over the book-burning-party story. People were trying to discover who was behind it. The library director didn’t know, the Friends didn’t know, the city government didn’t know. It was under the guise of a group called Safeguarding American Families, using some sketchy election filings. As far as we could tell, it was a sick joke or worse. The citizens in Troy were repulsed by this so-called “party” and took to social media to express that sentiment. Comments such as “You people are sick” and “This is disgusting” were common. The anti-tax group and the library campaigners traded blame. But it did get people talking, and it got voters who were not paying attention to get engaged in the conversation. The book burning got blood boiling. Once LB had people’s emotional attention, it went into the next phase of its strategy, which was to reveal its true support for the library by asserting that closing a library was as ridiculous as burning books. The ad agency still kept its identity fairly under the radar as it created a Facebook page urging citizens to vote “yes” to save the library. It employed advertising on mobile billboards to get the message out. The book burning buzz ran right up to Election Day. Thankfully, the millage passed with 58% of the vote. Leo Burnett has a large office in Troy and has some employees who live here. So this was both business and personal. When the news came out that this large corporation was behind the book burning campaign, it received a lot of attention, both in the advertising community and the library world, with mixed reviews. Some weeks after the election, LB released a 3-minute video that explained the campaign (vimeo.com/35758683). While I am personally grateful that Leo Burnett decided to take a stand in the community and support the library, I wish the agency had offered to assist a year and a half earlier. That creative energy and expertise could have gone a long way to perhaps helping win the earlier library battle and quieting the political ugliness that only became even more inflamed over time. Nevertheless, I believe LB brought a unique and unprecedented awareness to the issue, rattled some cages, and tipped the scales to assist the community effort to pass the millage. Quantitatively, did LB’s hoax increase voter turnout? Did library use go up? There is no way to know with certainty. Leo Burnett said it spent $3,500 on the campaign, but the Detroit Free Press reported that the actual number was $70,000, according to campaign finance documents filed with the state (that included in-kind support). LB claimed that voter turnout went up 342%, but election statistics don’t bear that out. What is important is that the campaign flipped the script and got some people off the couch. But a direct correlation between the book burning campaign and hard numbers just isn’t possible. What numbers are quantifiable? When library programming was reinstated, people started coming back in droves. Library usage has since returned to pre-2009 levels, some of the library’s highest before all the turmoil began. I give due credit and appreciation to Leo Burnett for its efforts as a valued member of the corporate community. But I have no doubt that had it not been for the hundreds of committed citizens who spent thousands of hours knocking on doors, writing and collecting checks, and debating with their neighbors to save the library for the year and a half before the LB campaign, none of this would have been successful. There were no fancy trophies for those advocates, but their hard work was no less important and commendable. They saved the Troy Public Library, and they have the satisfaction of knowing that they made a difference in their community. It took three millages to save TPL. It was not without compromise. TPL currently runs 6 days a week and has less funding and a shorter millage time frame. Some library staffers were added, and thanks to the Friends’ generous giving, programming has been restored. The Troy Public Library saga is far from over. The anti-tax factions still exist here, but their negative tactics are now in the open for all to see. The battle will begin anew as the millage comes up for renewal in 2016. There is already talk that with all the cuts the city councilors have made in the last 5 years, they can afford to do away with the library millage and absorb the library back into the city budget. And so perhaps it begins again. While there are many civic issues that bring citizens out to take a stand, there were few like our library’s. It exposed a deepening concern about the relevance of libraries in the digital age. During the campaign, we heard it all. For instance, “Who needs a library when we have computers?” and “Why not just buy everyone a laptop and let them stay home? It would be cheaper.” A sitting city councilman admitted that he had never been in the library. These are the issues of the day for public libraries, and the work to improve services and to spark the target users in new and innovative ways must continue. One the bright side, our Friends organization was nationally recognized with one of the 2011 Baker & Taylor Awards for our efforts to save the library (tinyurl.com/l7d6kye). The Friends of Michigan Libraries also recognized FTPL with its top award. The Friends of TPL put marketing at the forefront of its strategic plan for raising awareness of the library. We learned during the millage campaigns that a better web presence, more robust social media, and good marketing plans go a long way toward pushing the message out. We also learned that it isn’t enough to have the support of library users; you must go beyond the brick and mortar to gain the support of the nonuser community too. An engaged citizenry is a very good thing. An enraged citizenry is a challenge. In Troy, after 2 years of battles followed by some very difficult legislative campaigns, citizens are weary. While there is an active group that is well-informed and interested in community affairs, many have become tired of dirty politics and are starting to step away from involvement. Moving forward, the library, in concert with a strong and active Friends group, needs to keep building community support. It needs to include local businesses because a strong public library is good for economic development. It must find ways to partner with the school districts and school boards. It’s the same everywhere: Ongoing library advocacy will generate the foundation for support when you need it. Rhonda Hendrickson is the former president of the Friends of the Troy Public Library in Troy, Mich. Her term ended in 2013. She holds an M.L.I.S. from Wayne State University in Detroit. 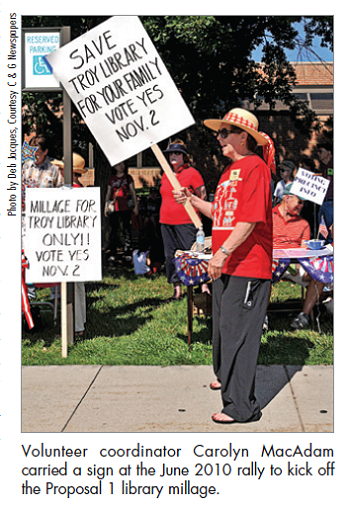 She was the committee chair for the Citizens to Save the Troy Public Library campaign. She is also a film producer in the advertising industry in the Detroit metro area. Her email address is hendricksonftpl@gmail.com.